The University of Maine women’s basketball team is off to its best start in league play since the 2004 season by virtue of its 76-65 triumph over UAlbany on Saturday afternoon at the Cross Insurance Center in Bangor. UMaine is now 4-0 in America East and 11-6 overall. What appeared as though it was going to be a comfortable win turned into a dogfight that had the 1,733 fans squirming in their seats. UAlbany rattled off a 28-10 run spanning 10:08 in the second half to slice a 24-point deficit into a six-point affair with 3:03 to go. But Tanesha Sutton scored in the paint with 2:35 left and grabbed an important offensive rebound following a Blanca Millan steal and a missed jumper by Dor Saar before Parise Rossignol calmly sank two free throws with 1:21 left to rebuild the lead to 10. UAlbany couldn’t get any closer than seven the rest of the way. Saar made two free throws with 45 seconds left to make it 74-65 after Amanda Kantzy nailed a 3-pointer for UAlbany. 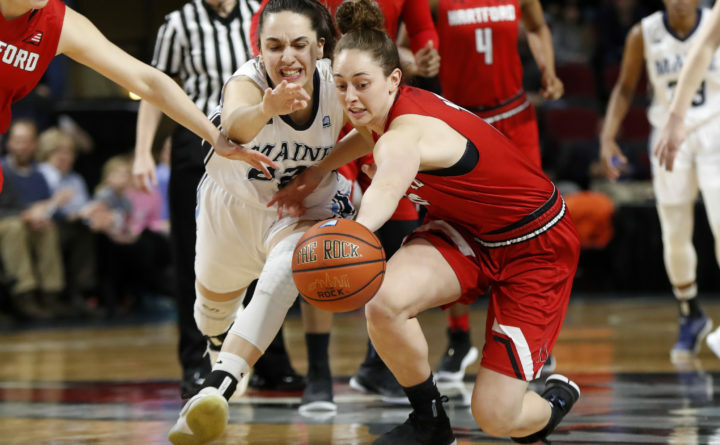 It was the Black Bears’ 10th straight win over an America East opponent at the Cross Insurance Center, including last year’s triumph over Hartford in the AE championship game. “Once we learn to play the full 40 minutes, we’re going to be really, really good,” said Van Buren native Rossignol. UMaine has won 52 of its last 58 America East home games. Junior guard Blanca Millan scored a game-high 27 points for UMaine and she also provided five steals and four rebounds. Rossignol netted 20 points and Tanesha Sutton contributed 15 points and six rebounds along with five assists and two steals. Saar had seven assists and four points, Kelly Fogarty had six points and Fanny Wadling wound up with five assists. Kantzy’s 14 points and six rebounds and Heather Forster’s 13 points and six rebounds led UAlbany (4-12, 1-2 AE), Khepera Stokes had 12 points and Kyara Frame had 11 points and six assists. “Maine shot the lights out. They’re a very talented team. They have five threats on the floor,” said first-year UAlbany coach Colleen Mullen. “They can hit you with a lot of different things, offensively. “But I can’t say enough about the toughness of our players,” added Mullen. UMaine built a 58-34 lead by outscoring UAlbany 15-2 during a third-quarter spurt that spanned 6:39. UMaine forced six turnovers in that stretch. Sutton had seven of the 15 points, Millan had five and Rossignol hit a 3-pointer. Vachon rested four of her starters over the final 2:16 of the third period and UAlbany went to a full-court press and went on a 5-0 run against the reserves to jumpstart its comeback. The press bothered the UMaine starters in the fourth quarter and UMaine went 1-for-5 from the floor during one spell. UMaine forced 17 turnovers that led to a 22-8 edge in points off turnovers. Both teams shot well in the first half as UMaine took a 43-32 lead into the intermission. “We moved the ball really well in the first half. We made our cuts and that opened up our shooters,” said Rossignol. The Black Bears shot 53.3 percent from the floor in the first half (16-for-30) while the Great Danes were an even better 56 percent (14-for-25). Millan had 16 points to lead all scorers in the first half and Rossignol had 13. Sutton and Fogarty added six apiece and Saar contributed five assists. Forster had 11 points for UAlbany with Schecter and Frame netting six apiece and Kantzy contributing five. UMaine outscored UAlbany 12-4 in second-chance points and had a 7-2 edge in points off turnovers. UMaine used a 15-3 spurt spanning the first and second quarters to turn a three-point lead into its biggest lead of the half at 32-17. Fogarty closed out the half by banking in a 3-pointer from near midcourt. But the Great Danes took advantage of their superior size to pound the ball inside and they responded with an 11-5 run that closed the gap to 37-28. The 6-foot-2 Forster had four points during the flurry and the 6-3 Schecter and 6-2 Chyanna Canada also had baskets before the 5-2 Frames capped it with a conventional three-point play. UMaine visits Hartford on Wednesday and travels to Stony Brook on Saturday.